Bakken Oil Production Is Already Declining, But is it about to Crash? Bakken oil production has already declined in 2015. There is compelling evidence that this decline is going to accelerate significantly in the next couple of months. If that happens the recovery we have seen in oil prices in recent weeks is also going accelerate. Being as the market likes the fact that U.S. production growth appears to have already halted, it will be thrilled to see production start to unexpectedly decline. These are the numbers nobody is talking about even though they should be. The chart above shows average daily North Dakota state production over the last six months as provided by the North Dakota DMR. February 2015 production of 1,177,094 barrels per day was below the September 2014 level of 1,186,355 barrels per day and considerably less than December 2014’s 1,227,529 barrels per day. Six months ago you wouldn’t have found anyone who would have believed that North Dakota production would be flat in the subsequent six months. 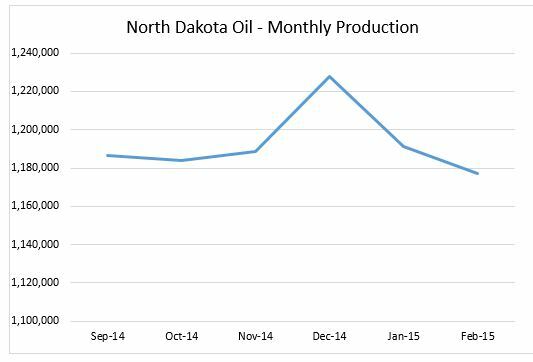 There is now reason to believe that six months from now North Dakota production will have experienced a much more significant decline. It is generally accepted that there is roughly a three month delay between the time a horizontal well is drilled and when it starts producing. The lag is due to the fact that each horizontal well also has to be fracked and then tied into pipelines. Continental Resources (CLR-NYSE) CEO Harold Hamm referred to this three month lag in his recent appearance on CNBC. That means that North Dakota (essentially Bakken) production in the first quarter of 2015 was influenced by the drilling rig activity in the final quarter of 2014. The average rig count on the far right is useful, but the number of “spuds” (new wells commenced) is even better. The number of new spuds on a monthly basis stayed above 210 for all of 2014 until December. While that spud count was above 210 North Dakota production kept growing. But in Q1 2015 that production growth ended. In fact production declined following the slightly reduced rate of drilling at the end of 2014. Even in January the spud count was as high as 186. February was down a lot more at 142 and March (unofficial) further still at 125. Remember that there is unquestionably a lag between wells being drilled and put on production. The impact of these first quarter spud count is going to show up in April, May and June. That spud count on average in Q1 based on those DMR numbers is 151. That is considerably lower than the average Q4 spud count of 208 which produced slowly declining Q1 production. What are we going to see in the coming months with the reduced Q1 number of spuds? Answer: Even lower production. Now there are a lot of variables involved here–including whether a drilled well has actually been completed and put on production. There are companies that have drilled wells but have chosen to not spend the money to frack them until oil prices improve. 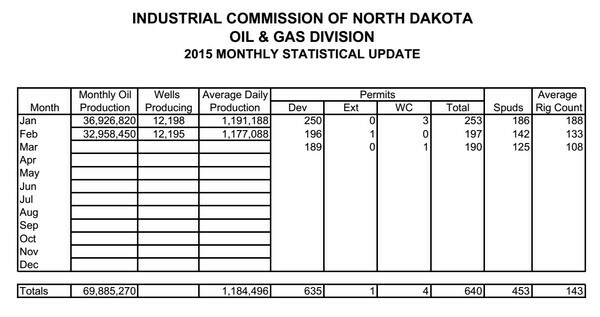 The current rig count in North Dakota is now all the way down to 88. 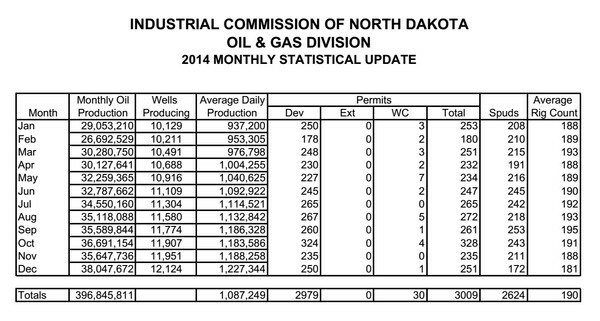 We have seen a decline in North Dakota production with rig counts of twice that level. Even in January the rig count still averaged 188. If North Dakota production was declining with 188 rigs in action doesn’t it make sense that the rate of decline is going to increase further with the rig count and number of wells at less than half that level? What is happening in the Bakken and North Dakota is not unique to that area. The same trends are being seen in the Eagle Ford and the Permian. The Permian rig count was slower than the Bakken to drop, so the impact there may be a little later. The flattening of U.S. production was enough to get a bid under WTI prices (a bigger bid than I expected this fast). If the market gets a whiff of these shale plays heading into actual decline already the price of WTI could really catch a bid. Prosperity is about Peace, not Worry. You can have peace knowing what stocks to buy when--Click HERE to stop worrying and working so hard to make money. Previous post: Is the Oil Price Now in a BIG GAP for Investors?